Rolling is one of the most important industrial metal forming operations. Hot Rolling is employed for rolling of steel slabs to hot strips in hot strip mills. Like any other hot rolling operations, rolling of hot strip is also a plastic deformation of the material of the slab caused by compressive force applied through a set of rolls. The cross section of the slab is reduced by the hot rolling process. The material gets squeezed between a pair of rolls, as a result of which the thickness gets reduced and the length gets increased. Rolling of hot strip is done at high temperature because of requirement of large deformations. Hot rolling results in residual stress free strip. Normally, oxide scaling is accompanied with the hot rolling, due to which dimensional accuracy is inferior when compared with the dimensional accuracy of the cold rolled strips. For rolling of hot strip, the slabs are heated initially at 1100 deg C to 1300 deg C. The temperature in the last finishing stand of the hot strip mill varies from 700 deg C to 900 deg C. It is always to be above the upper critical temperature to produce uniform equiaxed ferrite grains. The objective during the rolling of hot strip is to decrease the thickness of the slab with an increase in the length and with very little increase in the width. The material in the centre of the strip is constrained in the direction across the width of the strip and the constraints of undeformed shoulders of material on each side of the rolls prevent extension of the strip in the direction of the width. This condition is known as plane strain. The material therefore gets longer and not wider. Fundamental concepts applicable during the rolling of hot strips are (i) the arc of contact between the rolls and the material being rolled is a part of a circle, (ii) the coefficient of friction is constant in theory, but in reality it varies along the arc of the contact, (iii) the material being rolled is considered to deform plastically during the rolling, (iv) the volume of the material is constant before and after rolling (in practice the volume can decrease a little bit due to close-up of pores), (v) the velocity of the rolls is assumed to be constant, (vi) the material only extends in the rolling direction and no extension in the width of the material, and (vii) the cross sectional area normal to the rolling direction is not distorted. The main variables in rolling which influence the rolling process are (i) roll diameter. (ii) deformation resistance of the material as influenced by metallurgy, temperature and strain rate, (iii) material flow stress, (iv) friction between the rolls and the material being rolled, and (v) presence of the front tension and/or back tension in the plane of the strip. Forces and geometrical relationships in rolling of hot strip are shown in Fig 1. 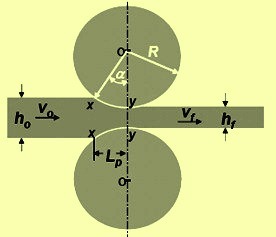 The material to be rolled with a thickness ‘ho’ enters the rolls at the entrance plane x-x with a velocity ‘vo’. It passes through the roll gap and leaves the exit plane y-y with a reduced thickness ‘hf’ and at an increased velocity ‘vf’. Given that there is no increase in width, the vertical compression of the metal is translated into an elongation in the rolling direction. Since there is no change in metal volume at a given point per unit time throughout the process, therefore b*ho*vo = b*h*v = b*hf*vf, where ‘b’ is the width of the strip, ‘v’ is the velocity at any thickness, and ‘h’ is the intermediate between ‘ho’ and ‘hf’. Considering b*ho*vo = b*hf*vf, and if bo = bf, then ho*Lo/t = hf*Lf/t, then ho*vo = hf*vf which means that vo/vf = hf/ho. This means that when ho > hf, then vo < vf. Hence, the velocity of the strip steadily increases from entrance to exit such that a vertical element in the strip remains undistorted. At only one point along the surface of contact between the roll and the strip, two forces act on the material. These are (i) a radial force Pr, and (ii) a tangential frictional force F. Between the entrance plane (x-x) and the neutral point the strip is moving slower than the roll surface, and the tangential frictional force, F, act in the direction (Fig 2) to draw the metal into the roll. On the exit side (y-y) of the neutral point, the strip moves faster than the roll surface. The direction of the frictional fore is then reversed and opposes the delivery of the strip from the rolls. Pr is the radial force, with a vertical component P (rolling load – the load with which the rolls press against the material). The specific roll pressure, p, is the rolling load divided by the contact area and can be given by the equation p = P/b*Lp, where b is the width of the strip and Lp is the projected length of the arc of contact. 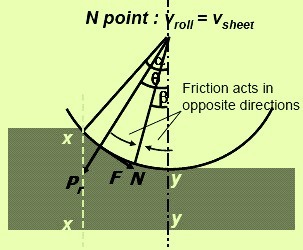 The distribution of roll pressure (Fig 3) along the arc of contact shows that the pressure rises to a maximum at the neutral point and then falls off. The pressure distribution does not come to a sharp peak at the neutral point, which indicates that the neutral point is not really a line on the roll surface but an area. The area under the curve is proportional to the rolling load and the area in shade represents the force required to overcome frictional forces between the roll and the strip. The area under the dashed line AB represents the force required to deform the metal in plane homogeneous compression. Roll bite condition is the condition which determines the material to be rolled to enter the throat of the roll (Fig 4). For this to happen, the component of the friction force is to be equal to or greater than the horizontal component of the normal force (Fig 4). That is F Cos a >/= Pr Sin a where ‘a’ is the angle of bite and Pr is the radial force. So F/Pr >/= Sin a / Cos a >/= Tan a. Since F = u*Pr where F is the tangential frictional force and ‘u’ is coefficient of friction. Hence u = Tan a. If tan a > u, the material cannot be drawn through rolls and If u = 0, rolling cannot take place. Therefore free engagement takes place when u > tan a. For increasing the effective values of u, for example grooving the rolls parallel to the roll axis is done or big diameter rolls are used to reduce tan a or if the roll diameter is fixed, the thickness of material to be rolled is reduced. In the case of no friction situation, the rolling load (P) is given by the roll pressure (p) times the area of contact between the metal and the rolls (b*Lp). (P= p*b*Lp) where the roll pressure (p) is the yield stress in plane strain when there is no change in the width (b) of the sheet. However, in practical situation there is friction. Frictional force is needed to pull the material into the rolls and is responsible for a large portion of the rolling load. High friction results in high rolling load, a steep friction hill and great tendency for edge cracking. The friction varies from point to point along the contact arc of the roll. However, it is very difficult to measure this variation in u, all theory of rolling are forced to assume a constant coefficient of friction. For hot rolling of the strip, u is around 0.2 up to sticky condition. The roll force increases with increase in roll radius or increase in reduction of thickness of the strip. The rolling load increases with reduction in the thickness of the strip or increasing in the roll diameter. Below a certain minimum thickness of the strip (below a critical thinning), the rolling load increases to very high value, because the resistance of the strip increases to very high values. As a result, it may not be possible to roll the strip. Instead the strip just gets pushed in between rolls, without appreciable reduction in thickness. In order to roll thin strips, it is necessary to use rolls of smaller diameter, backed up by large diameter rolls. Since the length of arc of contact decreases with roll radius, the coefficient of friction increases, the rolling load also increases. When high forces generated in rolling are transmitted to the material to be rolled through the rolls, there are two major types of elastic distortions. These are (i) the rolls tend to bend along their length because the material tends to separate them while they are restrained at their ends causing the thickness variation, (ii) the rolls flatten in the region where they contact the strip resulting into increase of the radius of the curvature causing the roll flattening. Under high rolling forces, the rolls flatten and bend, and the entire mill is elastically distorted. Mill spring causes the thickness of the strip exiting from the rolling mill to be greater than the roll gap set under no-load conditions. Precise thickness rolling requires the elastic constant of the mill. Calibration curves are needed. The elastic constants are usually in the range of 1 GNm-1 to 3 GNm-1 for screw-loaded rolling mills and around 4 GNm-1 for hydraulically loaded mills. Due to roll force, the rolls are subjected to deflection and they bend resulting in larger thickness at the centre of the rolled sheet and the edge being thinner. This defect is known as crown and camber. In order to avoid this, rolls are given a slight curvature on surface by grinding so that the centre of the rolls has higher diameter than the edges. This is called cambering of rolls. The bulged rolls, when subjected to bending during rolling produce flat strips. For strip rolling, normally camber of 0.5 mm on roll diameter is provided. Also during hot rolling, rolls get heated up and bulge out at the center, causing camber of the rolls. This is due to temperature variation between edges and the centre of the rolls. Roll camber has to be varied during rolling in order to take care of roll camber due to both thermal effects and roll deflection. This also avoids uneven roll wear (rolls wear more at edges than at centre). Roll camber can be varied by (i) bending the work rolls by applying external force, (ii) shifting of work rolls laterally with respect to centerline of the strip, (iii) using shaped rolls (rolls with profiles), and (iv) rotation of the axis of the work roll with respect to axis of back-up roll in horizontal plane (results in deflection of work roll ends, producing camber). Roll flattening takes place when there is increase in radius of curvature of rolls due to the roll pressure which causes elastic deformation of rolls. This is known as roll flattening. Roll flattening leads to increase in contact length and hence an increase in roll force. It has been stated earlier that the rolling load is dependent on roll diameter. Higher is the roll diameter then higher is the roll force. Similarly, smaller reductions require lower roll force. In order to reduce the roll force, there is requirement of reducing the roll diameter, or reducing of the friction. Another method of reducing rolling force is to apply a small tensile force on the strip. Application of tensile force longitudinally reduces the compressive yield strength of the material in the transverse direction. This is apparent from the Tresca yield criterion. In rolling, tensile force in longitudinal direction is applied at the entry section through a feeder or uncoiler with braking system. Forward tension is applied at the exit section through the coiler by controlling the torque on it. Roll torque can be estimated from the rolling force. Torque is equal to force multiplied by the radius at which the force acts. Total roll torque consists of the rolling torque plus the torque required to overcome friction in roll bearings plus torque at motor shaft plus torque for overcoming friction in transmission system. Roll power is applied in order to deform the work material, to overcome friction in rotating parts etc. If a high enough back tension is applied, the neutral point moves toward the roll exit. This means that the rolls are moving faster than the material. If the front tension is used, then the neutral point moves toward the roll entrance. Normally back tension is almost twice as effective in reducing the rolling load as front tension. Spread refers to the increase in width of rolled strips of low width to thickness ratios – square sectioned strips for example. Reducing the friction, increasing the roll radius to strip thickness ratio and using wider strips can reduce the roll spread. A pair of vertical rolls called edger rolls can be used to reduce spread. Control of strip thickness and cross-section is a real challenge in a hot strip rolling mill. In order to continuously monitor the thickness of strip being rolled, x-ray or gamma ray sensors are used. Precise control of gauge of rolled strip can be done by adjusting the roll gap. Gauge control in hot strip rolling mills is achieved through measurement of strip thickness using x-ray gauge and adjusting the strip tension using feedback control system. During the rolling of hot strips, the hot strip is coiled to handle its increasing length due to a reduction of thickness. Further it is important to reduce the complication of controlling strips of different speeds due to different thicknesses since the thinner section moves faster during its rolling in the hot strip mill. The problem of surface quality of hot rolled strips belongs to the basic priority of the production process. Each imperfection of the material can cause defect or decreasing quality of final product. Possible source of surface defects for hot rolled strips can be at different step in the manufacturing process such as (i) production and casting of liquid steel, (ii) reheating of slabs, and (iii) rolling of hot slabs. Between the most problematic surface defects, the initiators of surface defects are created during process of production and casting of liquid steel and include (i) inclusions, (ii) blowholes, (iii) scabs, (iv) lines of oxides aluminum, (v) holes, and (vi) longitudinal, transverse and the edge cracks. The condition of reheating slabs in reheating furnace and hot rolling process represents further creation and evolution of defects. The technological operation of heating and rolling can also create the specific surface defects such as shell surface, thermal cracks, hangnails, slivers, scales, squeeze of rolls, scratches and other defects. The accumulation of defects in material during the technological operation causes decrease in mechanical properties and the fractographic analysis reveals another degradation mechanism in the material. Some defects like porosity, cavity, blow hole occurred in the cast slab gets closed up during the rolling process. Longitudinal stringers of non-metallic inclusions or pearlite banding are related to melting and solidification practices. In severe cases, these defects can lead to lamination which drastically reduces the strength in the thickness direction. Defects arising during rolling are described below. There are two aspects to the problem of the shape of a strip. These are (i) uniform thickness over the width and thickness which can be precisely controlled with modern gauge control system, and (ii) flatness which is difficult to measure accurately. Shape problems are greatest when rolling in thin strip because fractional errors in the roll gap profile increase with decrease in thickness, producing larger internal stress. Thin strip is also less resistant to buckling. Mild shape problems can be corrected by stretch leveling the strip in tension or by bend flexing the strip in a roller-leveller. Mill spring is a defect in which the rolled strip is thicker than the required thickness since the rolls get deflected by high rolling forces. Elastic deformation of the mill takes place during rolling. Mill spring can be avoided, if stiffer rolls are used which means that the roll material is having high stiffness or elastic constant. Normally elastic constant for mills may range from 1 to 4 GNm-1. Roll elastic deformation can result into uneven strip thickness across. Roll material is required to have high elastic modulus for reducing the roll deformation. For producing very thin gauge strips, small diameter rolls are used. They are supported with larger rolls. Generally, the minimum thickness of rolled strips achieved is directly proportional to roll radius, friction, flow stress. Roll flattening increases the roll pressure and eventually causes the rolls to deform more easily than the material being rolled. Flatness of rolled strips depends on the roll deflection. Strips become wavy as roll deflection occurs. The roll gap must be perfectly parallel to produce strips with equal thickness at both ends. The rolling speed is very sensitive to flatness. A difference in elongation of one part in 10,000 between different locations in the strip can cause waviness. If rolls are elastically deflected, the rolled strips become thin along the edge, whereas at centre, the thickness is higher. Similarly, deflected rolls result in longer edges than the centre. Edges of the strip elongate more than the centre. Due to continuity of the strip it can be said, that the centre is subjected to tension, while edges are subjected to compression. This leads to waviness along edges. Along the centre, zipper cracks occur due to high tensile stress there. Cambering of rolls can prevent such defects. However, one camber works out only for a particular roll force. In order to correct roll deflection for a range of rolling conditions, hydraulic jacks are used, which control the elastic deformation of rolls according to requirement. If rolls have excess convexity then the centre of the strip material has more elongation than the edges. This leads to a defect called centre buckle. Possible effects when rolling with insufficient camber include thicker centre means the edges are plastically elongated more than the centre, normally called long edges. This induces the residual stress pattern of compression at the edges and tension along the centre line. This can cause centre line cracking, warping or edge wrinkling or crepe-paper effect or wavy edge. Possible effects when rolls are over-cambered include thicker edges than the centre means the centre is plastically elongated more than the edges, resulting in lateral spread. The residual stress pattern is now under compression in the centre line and tension at the edges. This can cause edge cracking, centre splitting, and centre line wrinkling. Small thickness strips are more sensitive to roll gap defects leading to greater defects. Thin strips are more likely to undergo waviness or buckling. These defects are corrected by doing roller leveling or stretch leveling under tension. Stretch leveling is carried out between roller leveler rolls. During rolling the strip has a tendency to deform in lateral direction. Friction is high at the centre. Therefore, spread is the least at the centre. This leads to rounding of ends of the strip. The edges of the strip are subjected to tensile deformation. This leads to edge cracks. If the centre of the strip is severely restrained and subjected to excess tensile stress, centre split can happen. Non-homogeneous material deformation across the thickness leads to high secondary tensile stress along edge. This leads to edge cracks. Secondary tensile stresses are due to the bulging of free surface. Edge cracks can be avoided by using edge rolls. Edging defect is caused by inhomogeneous deformation in the thickness direction. If only the surface of the material being rolled is deformed (as in a light reduction on a thick slab), the edges are concaved. The overhanging material is not compressed in the subsequent step of rolling, causing this area under tensile stress and leading to edge cracking. This has been observed in initial breakdown of hot-rolling when h/Lp>2. With heavy reduction, the centre tends to expand more laterally than the surface to produce barreled edges. This causes secondary tensile stresses by barreling, which are susceptible to edge cracking. Due to non-homogeneous flow of material across the thickness of the strip, another defect occurs. This defect is called allegatoring. This is due to the fact that the surface is subjected to tensile deformation and centre to compressive deformation. This is because greater spread of material occurs at centre. Alligatoring occurs when lateral spread is greater in the centre than the surface (surface in tension, centre in compression) and with the presence of metallurgical weakness along the centre line. Surface defects are more easily in rolling due to high surface to volume ratio. Grinding, chipping or descaling of defects on the surface of cast slabs are normally required to be done before being rolled. Laps due to misplace of rolls can cause undesired shapes. Flakes or cooling cracks along edges result in decreased ductility in hot rolling of extra coarse grained slabs. Scratches can be due to tooling and handling. A variation in thickness is due to deflection of rolls or due to the rolling speed.